Pirelli will bring the following compounds to the rounds on the 2017 Formula One season in Spain (May 12-14), Monaco (May, 26-28), Canada (June 9-11) and Azerbaijan (June 23-25) which will be held on the Montmelò, Monte-Carlo, Montréal and Baku circuits respectively. (1) Each driver must save for Q3 one set of the softest of the three nominated compounds. 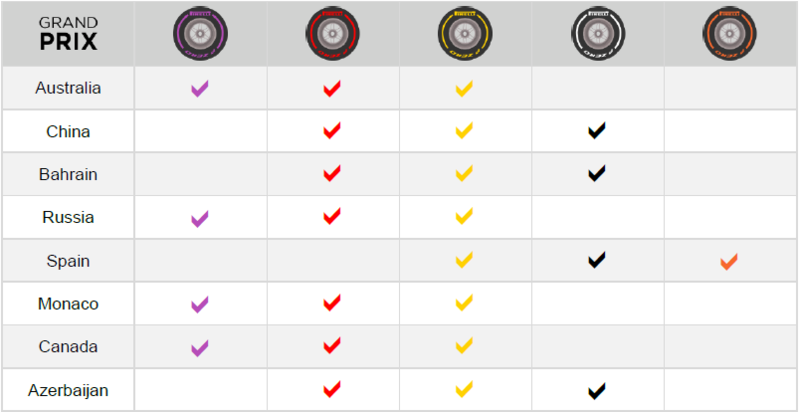 This set will be given back to Pirelli after Q3 for those who qualify in the top 10, but the remaining drivers will keep it for the race – as is the case currently. (2) Each driver must have both these sets available for the race and must use at least one of them. The teams are free to choose the remaining 10 sets (excluding the first five events this year, so until Spain, where Pirelli allocate the sets) thus making up 13 sets in total for the weekend. (*) The regulations mean that the tyre sets choice for the long-haul events has to be made by the teams 14 weeks in advance, whereas for the European races the deadline is 8 weeks in advance.